I always prefer to use natural products where possible so when I heard about Schwarzkopf's Essensity range, I was keen to give it a go. It's notoriously difficult to create natural haircare which delivers results and whilst Essensity doesn't claim to be 100% green, they have removed 100% amnomia, artificial fragrances & colourants, silicons, paraffin oils and parabens and kept the products as natural as possible, without compromising on results. The products contain organic essences and essential oils and are presented in suitably green coloured, 100% recyclable packaging. I was sent the Moisture Mask (£12.70 for 150ml) to trial which is designed to treat dry, coarse & lacklustre hair. 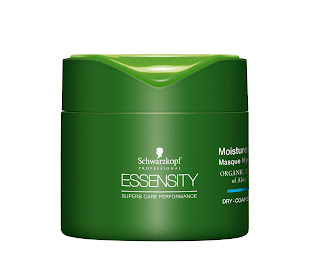 My hair is in fairly good condition at the moment, plus I had it cut last week so I viewed this as a maintainance mask. The mask is a thick cream which is presented in a tub. It's smaller than I expected but I discovered that a little product goes a long way (& I have long hair) so you should get a lot of use out of it before running out. There's a lighter coloured green on the lid which, stupid as this may sound, confused me somewhat. I was convinced that I was missing a trick and that this should be pressed to dispense the mask but after numerous tries by both myself and Mr.SkinDeep, I admitted defeat and unscrewed the top. The fragrance is incredible- fresh and fruity in a grown-up way although sadly doesn't linger once hair is dried and styled. The on-pack instructions are easy to follow, stating that you should leave the mask on towel-dried hair for 5-10 minutes before rinsing. I left the mask on for 5 minutes as I have fine hair and was worried that the mask might weigh it down. The only area in which the instructions are lacking is advice regarding how much product to use- as aforementioned, you really don't need much. I wouldn't use this whilst getting ready for work in the morning as it does add a bit of faff to the shower routine, having to jump out, towel dry hair and wait for 5 mins but it certainly isn't a complicated mask to use. As it's a thick formula, it didn't cause any mess so I was able to carry on with other beauty steps whilst waiting for it to work its magic, without any drips. Having said this, I found it fairly easy to rinse out. As with all of my trials, I kept the other steps in my regime as normal in order to fairly judge the benefits. My hair was left feeling soft and not at all weighed down which I loved. Styling seemed slightly easier than normal although this could well be due to my recent hair cut. It needed some calming products to tame the flyaways and definitely looked more smoothed the next day. I wouldn't say this created any noticable improvement to the shine of my hair & it's not a miracle worker but I'll certainly be using the mask again and would recommend it to anyone looking for a greener approach to their beauty regime.